This document and PEP 257 (Docstring Conventions) were adapted from Guido’s original Python Style Guide essay, with some additions from Barry’s style guide . When working with Python Scripts in Scorpion adding the following snippet will produce a nice header in the console windows for a script tool. HW Protocol – RS232, Profibus, DeviceNet, io or tcp/ip? In Scorpion there are a multitude of communication methods built-in and most of this is done without too much work. The most important tool for communication is the built-in python framework and the built in tdvcmdprotocol supporting tcp/ip and rs-232. There are two choices: Use the built-in RS232TDVCmdProtocol. This is very good no programming option. This is a “Siemens” protocol. This is supported using OPC. To use this option requires that you buy interface cards from the bus vendors. All these solutions provide an OPC-Server. Scorpion provides provide general client access to these servers. There are many ways of doing this. A popular approach is to interface with the Advantech products with the products Adam-6060 or PCI-1370. The adam-6060 provides io over ethernet and pci-1370 provides fast io based on an pci-card. InternetMessenger is one choice. Can be difficult use – it require that this protocol must be implemented on the PLC. The best choice is normally a custom tcp/ip protocol implemented in python. How to retrieve image size from python? How to activate Live Video? 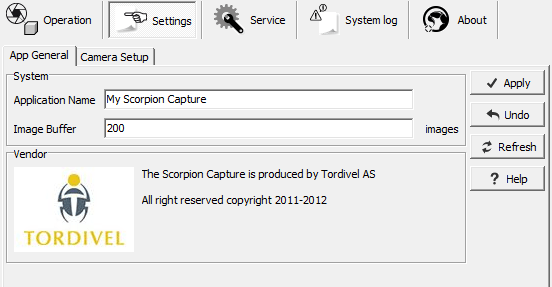 Try the new Scorpion 8 Extentions Installer to fix the problem. This error message is most probably due to missing/old Microsoft Runtime libraries incompatible with Scorpion 8 and python 2.6. The error message is most likely to be received when upgrading older XP machines.